When I wake up this morning, I’m conscious of the fact that it’s my final day in Rome. I’ve planned a side trip out along the Appian Way and getting there requires a ride on the Archeobus, which departs from Termini Station. There is no way I’m walking this time, so I buck up my courage and plunge into the Rome metro system instead. Until now, I haven’t used the transportation portion of my Roma Pass. I’ve heard too many horror stories about scam artists, pickpockets, roving gypsies, and graffiti. The London tube? Perfectly delightful. The metro in Paris? Piece of cake. But Rome? Perhaps it’s all in my head, but it seems unsafe and intimidating. I walk to the Colosseo stop, validate my pass, and wait for a Line B train to Termini Station. When it arrives I almost laugh aloud. It’s so encrusted with graffiti that the passengers can barely see out the windows. I can honestly say that Rome has exceeded my expectations in so many ways! 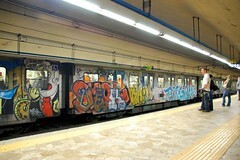 It’s not just graffiti, but graffiti on steroids, some of it quite interesting and nearly beautiful. The journey itself is uneventful, over in minutes. Outside the station in Piazza dei Cinquecento, I exchange my computer confirmation for a boarding pass and begin to wait. When it comes, the Archeobus is a strange lime green creation, like a bus with the roof gently scooped off, open-top but single deck. On board, it’s the usual stuff — a pair of low quality, brightly colored ear phones, monotonous commentary in the language of your choice, and a connection so marred by static that you can only hear every other word anyway. Convenience is what this is all about. 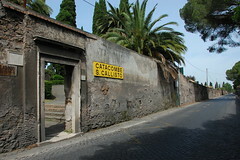 I want to see the Catacombs of San Callisto and the official directions are daunting, involving the metro and two bus lines. The Archeobus delivers me directly to the door. I’m able to catch a tour in English as soon as I arrive, and soon I’m enthralled by the guide, who happens to be a Catholic priest and a control freak. Father Rocco likes to position people just so, and is prone to giving elaborate instructions on who should move where to maximize space and visibility. We are both teachers, he and I, and I like this about him. As we move from an outdoor pavilion into the tunnels underground, I see that he’s donning a heavy, quilted jacket — a parka, really. This seems to worry others, too. How cold is it in there? As it turns out, not cold at all. At least to me. I think it’s hot outside. It’s cool and refreshing down under, but then again I’m from Vermont, where much of the year I aspire to any temperature above freezing. In the end, it’s an exceptional tour, the best I’ve been on since verger Ian’s at Westminster Abbey in the summer of ‘06. Father Rocco makes it so. He’s brilliant and I’m disappointed when he cites a study that shows that people only remember 10% of what they learn from guides. I’d like to absorb it all. History and religion is a fascinating mix. When I leave San Callisto, I pick up the first Archeobus I see along the Appian Way. It’s only after I board that I realize it’s heading in the wrong direction, back to Rome instead of further along the route towards the aqueducts. Que sera, sera. I decide to stay put and use the extra time to see some other sites on my list. I hop off at Santa Maria in Cosmedin, near the Circus Maximus, and snap a quick picture of “La Bocca della Verità,” or Mouth of Truth. It’s a carved stone face that was featured in the 1953 movie Roman Holiday with Gregory Peck and Audrey Hepburn. Legend has it that it bites off the hands of liars. Still in willful denial about that picture in the Sistine Chapel, I decide not to press my luck by inserting my own. From there, my free paper map shows me that I’m not far from Piazza Cavalieri di Malta, where my guidebook says there is a “secret keyhole” in a door that reveals a charming view of St. Peter’s. This is off-the-beaten path stuff and I decide to make it my mission to find it. When I do, I realize with some amusement that it’s darn near the center of the beaten path! There’s a small crowd queuing in front of a worn green door. The line never seems to shorten because everyone presses their camera lens to the keyhole, and everyone frowns at the screen afterwards in disappointment before making their way to the back of the line to try again. I decide to call it good enough on my second attempt. It’s a tough shot that requires manual focus, a steady hand, and a strong zoom. I think I managed two out of the three. So far, it’s been an interesting and eclectic day, so I decide to continue on the same theme. I sit for a while in a charming park on the Aventine Hill at Viale Nino Manfredi. Then I walk back to Piazza Venezia and on a lark decide to take the elevator to the top of the Victor Emmanuel monument to enjoy the view. I stop for a late lunch of gnocchi pomodoro at “Vecchia Roma,” and head back to the hotel for what has become my traditional afternoon siesta. 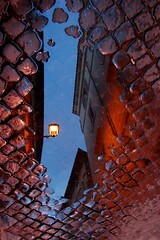 By early evening I’m back out on the street again, this time walking across the Ponte Garibaldi. At a souvenir stand just over the Tiber, I spot a row of boxer shorts sporting vertical stripes of red, white, and green to match the Italian flag. In the center, portions (um) of Michelangelo’s “David” have been cleverly inserted. It’s funnier even than the Pope-ener. I’ve arrived in Trastevere. Several years ago I heard a “soundseeing” tour of this largely residential neighborhood, recorded on a vibrant Sunday morning by a Dutch priest, Father Roderick Vonhögen. From the sound of church bells ringing at Santa Maria in Trastevere to his description of the smell of fresh baked bread, I was transfixed. Now, I am here to see it with my own eyes. It is… well, underwhelming. The architecture is impressive, but for the first time I am appalled by the amount of graffiti that I see. The basilica, however, is lovely. 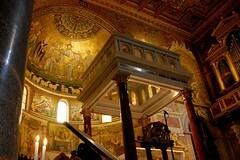 It is one of the oldest parish churches in Rome, and some believe it is the first church in the world where Catholic mass was celebrated openly. I stop on the portico to stare at fragments of carved marble embedded into the walls, taken from various tombs in ancient Rome. On the inside, there is another stunning mosaic in the apse, but my favorite is a statue in the rear of the church of St. Anthony of Padua, shown holding the child Jesus. 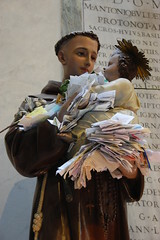 Into his arms and at his feet, parishioners have tucked hundreds of prayers, written on folded scraps of paper. If St. Peter’s is a testament to the wealth and prestige of the Catholic Church, this is proof of its relevance in the everyday lives of the faithful. For dinner, I head back over the Tiber to a pizzeria called “Gino ai Funari.” The waiter is an elderly man with boundless energy and a personality to match. When, halfway through, I add an insalada mista to my order, he curtseys and winks. When I decline dessert he gives me a wave of his pinky finger, paired with a hearty laugh. The place is slowly filling with Americans. I know this because I can hear them ordering their cans of Coca Cola Lite. I’m beginning to think that Gino is nipping our collective share of the vino. 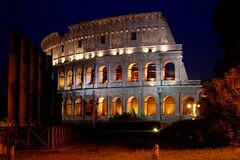 My final task in Rome is to take the perfect picture of the Colosseum, illuminated at night. I’m later than I’d like and trying to move quickly down the sidewalks that line the Via dei Fori Imperiali is not easy. The grandstands placed there for Monday’s parade have created a huge bottleneck. As I listen to one couple talk, strolling two abreast, hand-in-hand, I come to the realization that while Italians drive fast, they walk very, v-e-r-y slowly. I’d like to ponder that contradiction, but for now I’m chasing the light. In the end, all is well. I snap away happily until the last trace of blue leaves the sky. 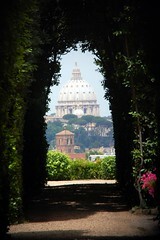 I have done all that I had hoped to do in Rome, and enjoyed it immensely. Veni, vidi, vici. I came, I saw, I conquered.